Like the mining industry throughout the world the copper mining industry in North America has a huge population of grid style couplings on a whole host of applications. 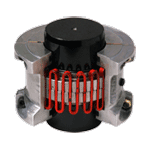 There have always been irritating problems with the grid couplings to include lubrication that in most cases created huge housekeeping issues. The other concern was the replacement of the coupling itself and in particular the removal of the hubs. Generally a hefty hammer and a torch were the tools of choice. Often removing the hubs could run into hours. Both of these problems while a pain were something they had learned to live with over the years. Recently a third problem has come to light. The very method the grid couplings are literally packed with lubrication creates ample opportunities for lubrication leakage. This problem has not escaped the notice of MSHA where under 4.2.1 Vehicle and Machinery Spills and Spill Notifications procedures are outlined to clean spills on both cement and on bare dirt. Once the lubrication falls on either the cement or dirt it is designated hazardous material and clean up procedures include scrubbing the cement and removing the contaminated earth. MSHA fines inevitably follow. The dollar amount seems to be predicated on the severity of the spill but are often substantial. The challenge was to come up with a coupling that did not require lubrication, that could handle the required torque and misalignment needs and that could be easily replaced if the need came up and finally it has to be cost effective. The SU disc coupling with shaft locking devices easily meet all the challenges. Mine maintenance teams are not as familiar with the disc couplings as would a power utility plant, a gas refinery, or even a pulp and paper mill. Lovejoy developed a disc coupling design with unique torque and misalignment features. Should the need be for a close coupled application there are two options. 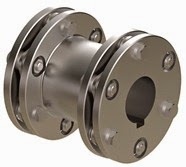 A simple single disc pack SU disc coupling offers 1 ½ degrees of misalignment and ample torque. Also for close coupled applications Lovejoy offers a two plane disc coupling (SXC) with more torque and misalignment capabilities than the SU. Finally spacer type units could be handled by SX or DI style couplings. All Lovejoy disc couplings eliminate the need for lubrication and coupling maintenance and can be inspected without disassembly. There are no wearing parts and they are resistant to the harsh environments evident in the copper mines. If you are faced with the three main problems I see from some of my grid coupling customers (MSHA violations, high maintenance, and hub replacement), consider a disc coupling with shaft locking devices as a solution. About the Author: Terry Davies is a proven wealth of mechanical power transmission knowledge, with many years of service on behalf of Lovejoy under his belt. To find a Lovejoy representative in your area with this type of knowledge, please see Lovejoy's Find a Sales Representative tool.